Dr. William T. Bolton commissioned the house from Greene & Greene but died before he could move in. His widow sold it to the Culbertson sisters, who made some changes to the original plan. This house was designed during a transitional stage between the simpler, earlier Craftsman houses that Greene & Greene architects built and the more impressive “ultimate bungalows” that characterized their later work, such as the famous Gamble House nearby. This staircase is one of my favorite things in the house. Simple, classic, beautiful. The Greenes used mahogany for the paneling and trim. The alcove was a later addition. Andersen says, “We added posts, benches and paneling to better integrate it with dining room.” Gorgeous. A reader was intrigued by a photo of this house in the January 2015 issue of Better Homes and Gardens and asked me to find out more about it for her (on page 14). When I learned it was a Greene & Greene that had been restored, I got all kinds of excited. So thanks to Christine for telling me to look into it! The 6-bedroom, 7-bath house is listed in the National Register of Historic Places. There’s more information about the restoration on architect Tim Andersen’s site with photos by Alex Vertikoff and John Muir. Some of these are older listing photos I found via Curbed. The Greene & Greene archives have the original house plans and black and white photos, which are pretty cool to see, too. Wow, so beautiful! And you are so right about the kitchen! Thank goodness it’s not all stainless steel & granite — would have looked out of place for sure. I cannot stop looking at the 18-pane, sliding door cabinets. I’ve never seen anything like them, truly beautiful work. Add this to my list of top-10 dream homes. Greene & Greene are my all time favorite architects. The Gamble House is incredible and a “must see” if you are in LA. This house is incredible. I just wish I hard a spare $2.8 lying around! What a gorgeous and thoughtful restoration project. This home is truly a treasure. Too many lovely features to list. Love the new kitchen especially! Wow. How wonderful to see a landmark brought back. Amazing workmanship and design integrity. Just wow. I hadn’t thought of that but you’re right, it does! What a nice restoration! Every single detail goes perfectly with the house, which I haven’t seen with many old homes that were fixed up or restored. Love the exterior color of the house! Where can I find the name of the paint color? You might want to check the architect’s website and see if he mentions it. I don’t remember seeing it, though. Absolutely LOVELY house! It looks classic without looking dated. I wish I could see a floor plan. Is there any way you can make it NOT a changing .gif? It switches so quickly I can’t read it. I wish I’d come across your article when I was researching this one. Thanks for the link! It’s so nice to see historic preservation done like this. Greene and Greene were amazing – thanks for showing us this beautiful house. And yes, they did put some huge doors on these. Makes entering the house an event! Oh Julia – this is jaw droppingly beautiful!!! Thanks so much for sharing. They did an amazing job and I really appreciate the attention to detail. The front door is beautiful, but visually odd to me in a way. It looks short. The door is proportionally much wider than normal. The handle is halfway up the door– much higher than normal. And the hinges even look oversize. The photos almost look like it’s a dollhouse. Wowza! That is beautiful from stem to stern. I like Craftsman style but this house has got to be one of the most dreary examples of it I’ve ever seen. That old addition in the front (two story bay) looks grafted onto the original—- sort of a Frankenhouse makeover. Too bad they didn’t get rid of that 1920’s mistake when renovating. Apparently that 1920s staircase window/addition was considered historic and they were not allowed to make any changes to things like that. Absolutely beautiful restoration. Love what they did with it. I love that Pasadena has rules where you cannot tear historic houses down or alter them. I would love to own a house like this. I couldn’t even imagine trying to furnish it though. I would highly recommend the book My Passion for Design written by Barbra Streisand. 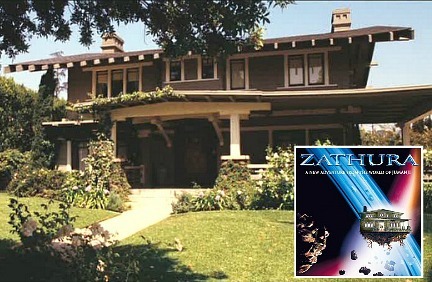 She designed a house in LA inspired by Greene & Greene. The rooms look exactly like these and the detail is amazing. I’m truly glad I happened to find your website, it allowes me an insight into American interiors that I would not have come across otherwise! How lovely! The photos of it in the snow look almost magical. Thanks, Maria! I came across the picture in the BH&G magazine you mentioned, and had to go look it up. That’s what led me to your wonderful feature. Thank you! Now, I feel like I’ve been there!